大部分的人都是點大三元牛肉麵 (牛肉, 牛筋 ,牛肚), 但是因為我不吃牛肚, 我就點了紅燒半筋牛肉麵, 選用的麵是粗麵. 品嚐第一口褐色的牛肉湯. 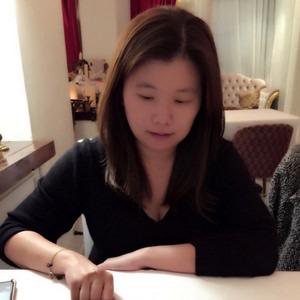 濃郁的牛肉香佈滿了整個味蕾, 湯頭帶有點油脂和香辣, 若覺得不夠辣, 可直接加他們桌上的秘製辣椒醬. 雖然粗麵本身煮得水平之上, 很可惜的是麵本身卻沒有吸收湯汁. 餐廳使用牛頰肉而不是牛腱, 經過長時間的熬煮, 膠質會跟筋和肉融合在一起, 牛肉本身會品嚐起來較軟且多汁, 牛筋的部分則是不軟爛且Q彈. 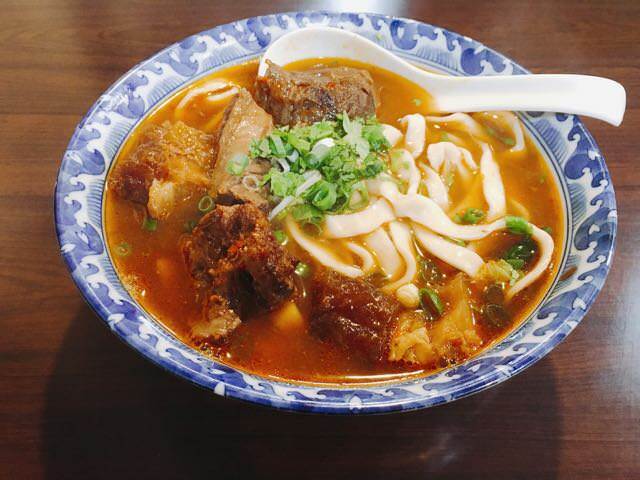 Most customers order “Beef, Tendon, Beef Belly” noodle. But, since I don’t eat beef belly, I choose “Half Beef Half Beef Tendon” with thick noodle. The first sip of the brown soup broth is delicious with mild beef aroma covering all over your tastebud. It is only a bit of oily with fair amount of spiciness. 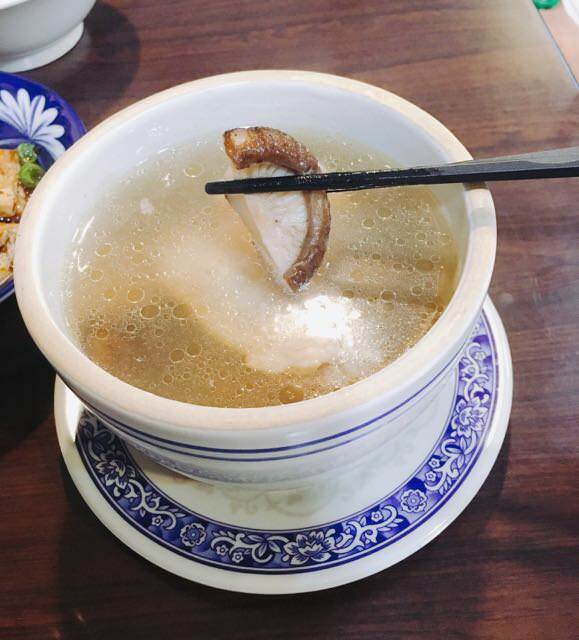 The thick noodle is cooked above average, however, it doesn’t seem to absorb the soup essence well. As for the main role- beef, the restaurant states that they use beef cheek instead of beef brisket. The reason is that after long-hour stewing with high temperature, the collagen would mix with tendon and beef cheek. The beef tastes juicer and the tendon is soft. 香菇吸收了雞湯的精華, 喝完濃厚牛肉湯頭, 雞湯則是清爽, 在無加味精的情況下, 雞湯頭依舊細膩且會一口接一口, 可惜的是當天的雞肉並沒有牛肉燉的好. Taking the first bite at the mushroom, you tastebud would taste the chicken soup essence. It is refreshing considering you just finished the spicy beef noodle. Without MSG, this soup can still taste yummy with natural chicken flavor. But, the legs and wings are a bit dry. The dish is at the right side of the picture. 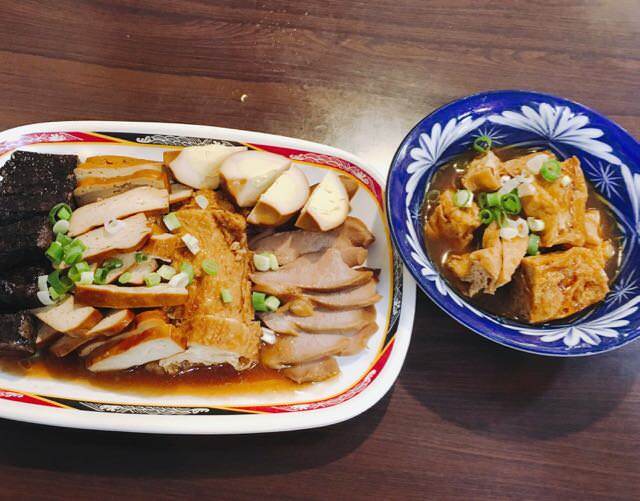 This is the most surprising dish because they serve the bean curd with the beef soup as base. The bean curd tastes juicy with mild beef aroma.